War is a strong tourist draw. That’s no surprise to me, I’ve toured many a battle field, from Culloden, to Saratoga, to Gettysburg, the Somme and the D-Day beaches. The one I visited today, however, is the most historically recent, and therefore sparks more genuine indignation. The realities of who did what to whom on a swampy field in Scotland have been softened somewhat by the intervening 271 years, but when your land is still occupied and your house and possessions now belong to some family from the conquering country who moved into it after you were forcibly ejected, well, that can still feel a little raw, even after 43 years. Our Greek-Cypriot guide started the day with a history lesson to bring us up to date, explaining how Cyprus was, from 1400 BC to 708 BC, under the control of the Greeks, then, from 708 to 333, they were under the control of Assyria, Egypt and Persia before being overrun by Alexander the Great. They were then conquered by the Romans, the Byzantines, the Ottomans, the British, a Girl Guide troop from Milton Keynes and, for a short time, Harry Styles from One Direction. I was dozing on and off during the lecture, so I’m not clear on a few of those. 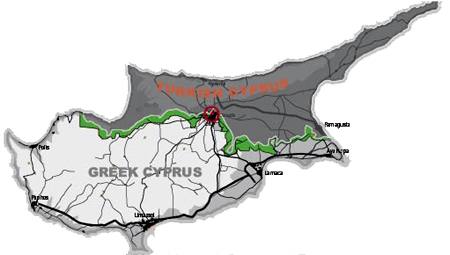 What is clear—our Greek-Cypriot guide assured us—is that on 20 July 1974, the Turkish army mounted an unprovoked and totally unjustifiable attack on the northern side of the island. The war was brief, but ugly, and resulted in a cease-fire that allowed the Turks to occupy the northern half of the island, while the Greeks held on to the southern half. A demarcation zone was set up along the Green Line (so named simply because it happened to have been drawn in green pen on the map) and is patrolled, in theory, by the UN, though I didn’t see any UN troops when I was there. The DMZ remained tightly guarded, and all but closed, for many years. There was only one checkpoint and the only way to get onto the Turkish side of the island was to go to Turkey and take a flight or boat from there, as Turkey was (and remains, I believe) the only country in the world that recognizes North Cyprus. Recently, however, realizing the advantages of tourist dollars, more checkpoints were added and the restrictions on travel have been relaxed. 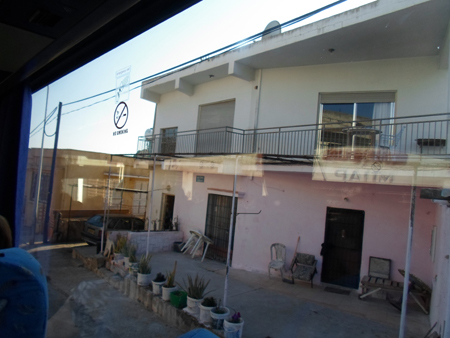 So now, for the first time in a generation, Greek-Cypriots can travel to the north to see who is living in their family home. 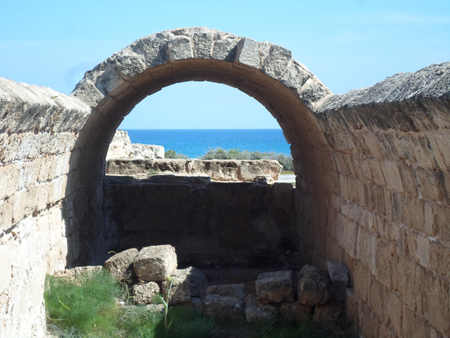 I hasten to add that Turkish-Cypriots can also travel to the south to see the same thing; war is never as black-and-white as our Greek guide wanted us to believe. 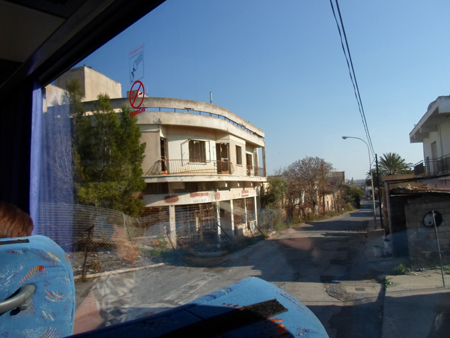 At the checkpoint, we acquired a Turkish-Cypriot Guide, who was to remain with us throughout our tour of the North, a requirement I associate with totalitarian regimes. But if the North is under totalitarian control, it is totalitarianism-lite, because our guide simply greeted us with a cheery “Hell-o” then settled down in the front seat of the bus and did sod all for the rest of the trip. Never in my life have I seen anyone with such a cushy job, and I was a New York State Civil Servant for twenty-five years. One of the most interesting features in the occupied zone was the Ghost City. This is a large area of high rise buildings, the ownership of which has been under dispute since the partition. The whole area is surrounded by fencing and razor wire and no one is allowed in except the Turkish military and UN officials. That's the Ghost Town side. This is the opposite side of the road, where people actually live. It doesn't look much better. So the towers stand empty, displaying the effects of war, and time. But that’s not the strangest thing about it. The strangest thing is, the Turkish government seems to believe it can be made invisible. 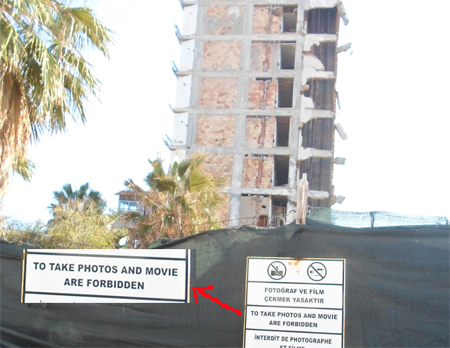 We were told as we approached that taking photos was verboten, and that being caught doing so could result in arrest (and, one must assume, a visit to a Turkish hotel ala “Midnight Express”). We were allowed to walk up to the wire, but not allowed to take photographs. 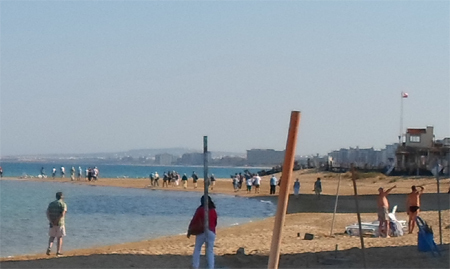 And on the beach, we could only take photographs if we were facing away from the enclosed area. Uh oh, I better not take any photos! 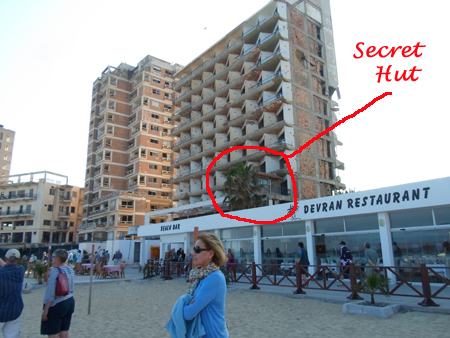 To enforce this, a secret hut, staffed by Turkish soldiers, is located in one of the towers. These soldiers spend all day spying down on the thousands of people on the beach to be certain none of them faces inland while holding a camera. Good luck with that. You are not allowed to point a camera this way. You can, however, point the camera this way. The Ghost Town extends as far as you can see. Another special feature of the Turkish side is its hospitality and food service industry. During my brief visit, I had what was most certainly, hands down, the worst meal I have ever been served. And, as a bonus, it came with the most appalling table service I have ever experienced. I ordered a Corona, my wife ordered orange juice. 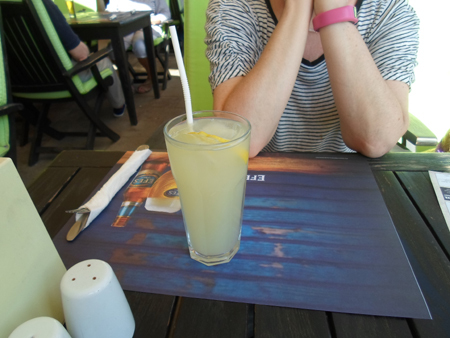 We were brought a Miller (“It’s the same beer,” the waiter told me) and lemonade (“It’s all we have,” he added). 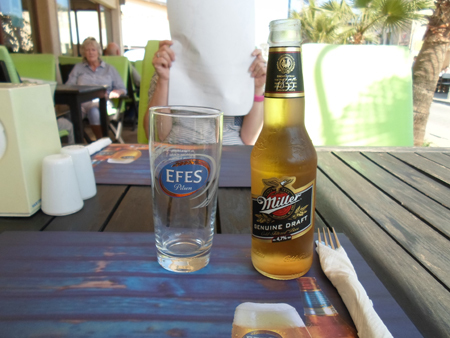 This is what you get when you order a Corona in North Cyprus. This is what you get when you order Orange Juice. I ordered a burger with French fries. What I got was a stale bun with a post-it note sized piece of lettuce and an equally sized slice of tomato, a pickle and a 1/8-inch-thick burger patty that was literally (not “literally” like most people use it, meaning “figuratively,” but literally LITERALLY) raw. I took one bite, realized how awful it was, and put it aside, focusing instead on my not-quite-done French fries. All 5 of them (yes, literally). To be fair, the pickle was ok.
All of this for a mere 15 euro. I won’t be frequenting that establishment, I can tell you that. 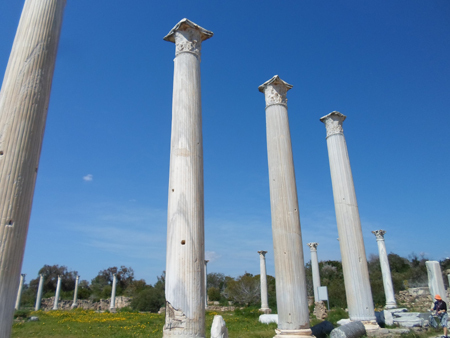 They have their share of ancient ruins in the north, but they have bullet holes in them. From there, we regrouped on the bus, exchanged horror stories (some other people from our group had chosen the same restaurant and had similar experiences), collected our Turkish guide (God knows where she went off to every time we stopped, but she never came with us) and headed south, to the land of the free. Nothing special, just a lovely view.